The creation cycle (black, circle shaped arrows) and the overcoming cycle (white, star shaped arrows). The alternation and combination of yang and yin generate water, fire, wood, metal, and earth, the five elements or five phases of qi. Like Yin and Yang, the five phases are five characteristics of qi that changes over time. 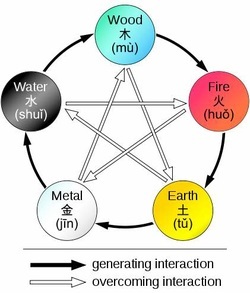 Fire , earth, metal, water and wood represent different manifestation of qi. The interactions of five phases creates all that exist on the heaven, earth, and human planes. Each phase has its own qi character, and interacts with other phases in different ways. 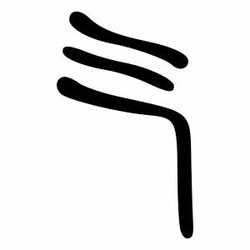 Fire qi radiates, earth qi compacts, metal qi contracts, water qi falls, and wood qi grows upwards. Each phase elements is associated with a season, directions, weather condition, colours, number and a trigram. In humans, the five phases correspond to our vital organs. It was incorporated in many fields of Chinese thought, such as geomancy or Feng shui, astrology, traditional Chinese medicine, music, military strategy and martial arts.